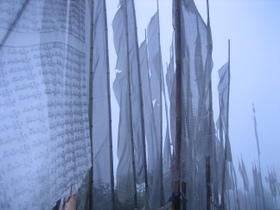 The mountain roads along Darjeeling and Sikkim were dotted with colorful Tibetan prayer flags. Sometimes, I spotted entire fields of them fluttering in the wind, whispering silent prayers to the heavens and bestoying blessings on the lands around them. 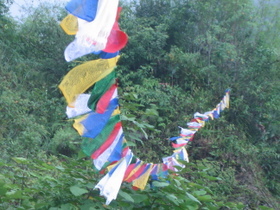 There is a strong Buddhist influence in the region as Tibet is no more than a day's drive. Ever since China annexed Tibet and began to stifle Buddhism, many Tibetans have crossed the border over to the North Eastern parts of India to practise their religion. There are many Buddhist monasteries in this area-more on that later.